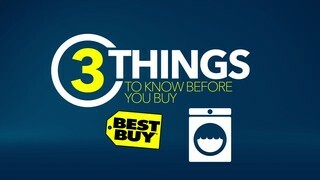 Before you buy, here are three things to know about washers & dryers. You kind of want you to think about your lifestyle. How big is your family? How much capacity that you need? Comparing capacity is actually pretty easy. The main thing that you want to look for is actual cubic footage for the drums. That's going to be the apples to apples in between brands. If you have a King bedding, do you want to wash that comforter at home? If you do, then we need to get to a certain size point for capacity of the drum. You can get high efficiency in both top load and front load style washers. Traditional top loaded washers have been around for a really long time. They do use a little bit more water than some of the other options out there. Front loaders are great. They're going to be the most energy efficient. It folds the clothes over using a lot less water in the processor. They're a lot gentler on your clothes, which I think is really important. Pedestal is a great accessory to your washer and dryer. They raise up the machine about 15 inches. It's right there at chest level for you. You do get storage space as well, dryer sheets, anything like that. Steam is available in both washers and dryers now. When you're washing your clothes, it loosens the fibers of your fabric. So the stains can come out more easily. When you're drying your clothes, it's a great option because it takes out the wrinkles. I do the steam refresh cycle and it comes out nice and wrinkle free. Sanitize is a great option. A sanitizing cycle is going to be where the water just get super hot. And kills the bacteria through that heat process. The moisture sensors within the driers will sense the amount of moisture left within the clothes. Rather than pulling those jeans out and going, oh, man, these are still damp, it'll actually extend the cycle longer. It'll sense how long it needs to dry for, so it'll stop when it needs to stop.